What brought us to Edinburgh Scotland? Last Wednesday we moved from the Lake District of England to Edinburgh, Scotland. We have grown accustomed to the trains running fairly close to on-time, so were caught by surprise by what turned into a 2.5 hour delay. Our first leg from Windermere to Oxenholme went smoothly. As we sat in Oxenholme waiting for our connecting train, an announcement was made that the trains in both directions were halted due to a “trespasser on the line”. We later found out that someone was on the bridge over the tracks threatening to jump and the police were on hand trying to talk him down. We never did learn of the outcome, other than a cryptic message on the Internet that the “trespasser had been removed”. As I posted on my Facebook page, I can only hope that he was safely talked down and was taken somewhere to receive the help he so desperately needs. Many of us have been touched by the devastation of having a friend or family member either threaten, try or succeed at taking their own life. My heart goes out to all of you that have known this pain, from either side of the equation. There is also online help and support at http://www.suicidepreventionlifeline.org. Or you can click here. Since arriving here in Scotland, the weather has reflected our somber mood and each day has had at least some rain. Even the sound of the bagpipes is melancholy. To use it as a home base for sightseeing jaunts to other places in Scotland. Because we enjoyed our one day stop while on the Ruby Princess and wanted to see more. 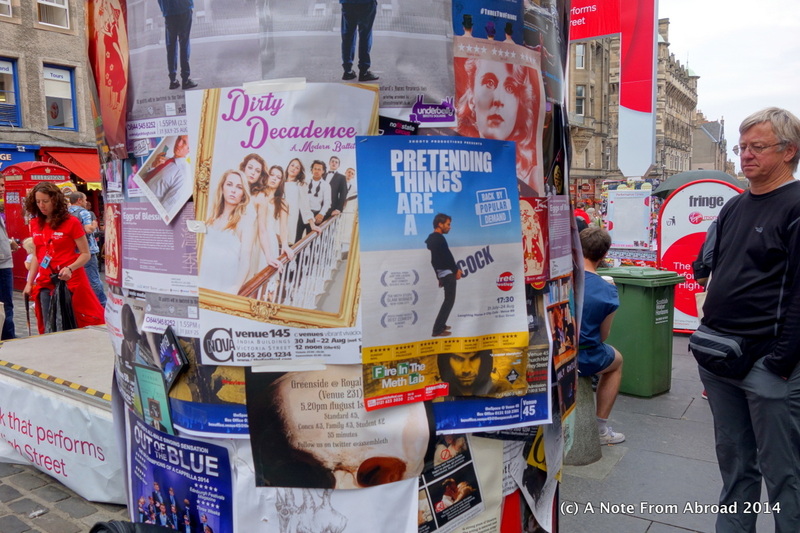 The Edinburgh Festivals are going on for the entire month of August and several people had recommended that it was fun, and well worth seeing. I did not realize that there are actually several different festivals going on simultaneously. The Military Tattoo is probably among the most well-known. We have purchased tickets online for Tuesday nights performance. 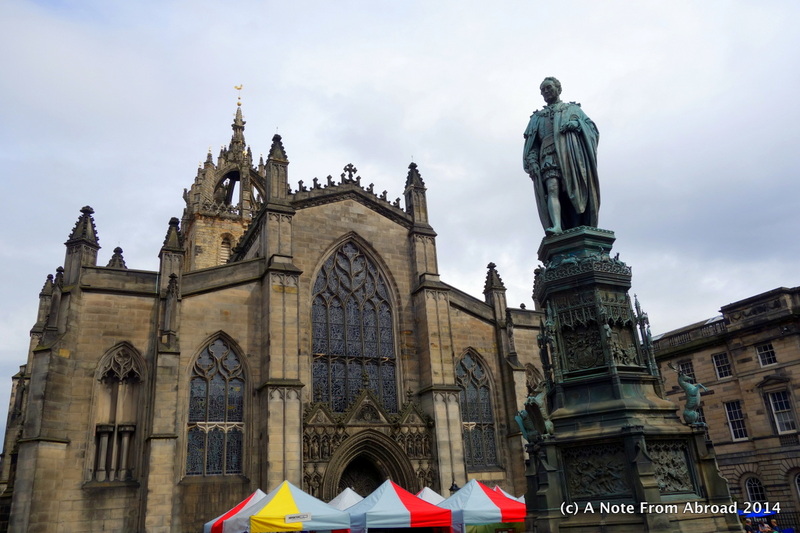 In addition there is an Art Festival, International Festival, Book Festival and the Edinburgh Fringe Festival. The town is swamped with locals, tourists, street performers, musicians, dancers, mimes, bagpipers, and singers. 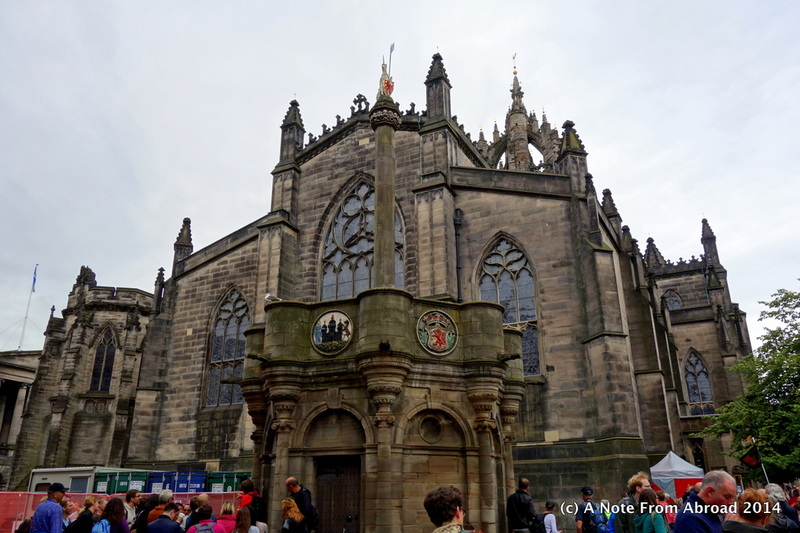 Just to walk down the main street, the “Royal Mile” is challenging. It seems that we from the US more often pronounce it like it rhymes with wheel barrow. I have also heard it end like berg or burg (like Pittsburg). Here in Scotland I most often hear it pronounced with a bruh ending. Like our word brush but without the sh sound. There is also another option, ending like burra. On youtube, it seems that the bruh ending is the preferred one. Gratitude Moment: Today I am grateful for whimsical creativity. Everywhere you look, people have come up with an original (or not so much) idea in which to grab your attention, earn a few coins or simply to entertain us as we walk by. 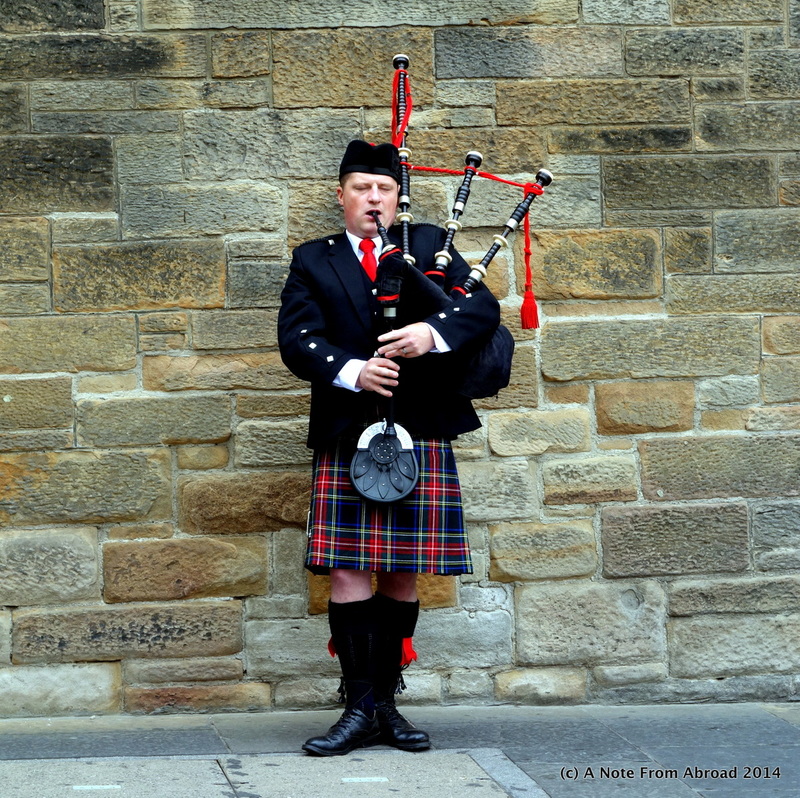 This entry was posted in Europe, Scotland and tagged Art Festival, Book Festival, Edinburgh, Edinburgh Festival, Fringe Festival, International Festival, Military Tattoo, Photography, Scotland, Travel. Bookmark the permalink. 2 Responses to What brought us to Edinburgh Scotland? As a student, getting in to the fringe activities and most events was very cheap. I was on a field trip from Harlaxton Manor where Stanford in Britain was located. That was in August of 1966! The Edinburgh Festival is a wonderful, long standing happening! May it continue. I’m so glad you got to experience the festival. There are still a lot of inexpensive plays and music events to be seen. A huge variety – now we just need to decide which ones to go to.